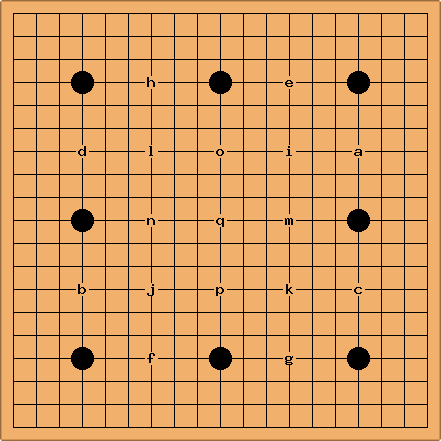 This page documents Chinese and Japanese conventions and proposals for placing more than 9 handicap stones. 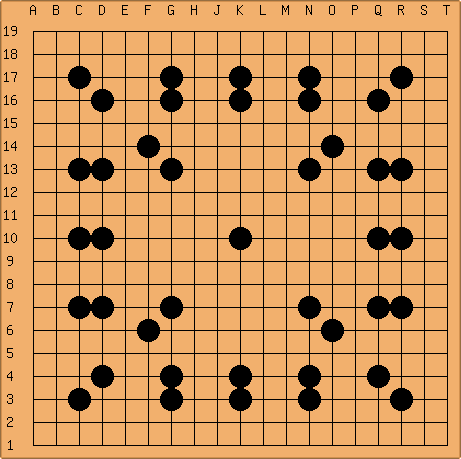 Bear in mind that many people who need such handicaps might prefer or do better to play small board Go such as 9x9 and 13x13. 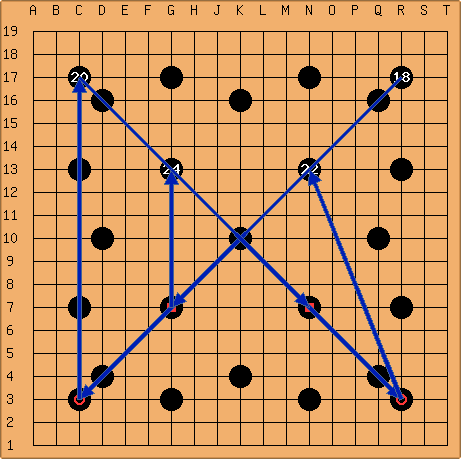 I (Hu) think this might be the Chinese pattern. Handicap stones 10 through 17 are at / R13 — / C7 — @ N3 — @ G17 — @ N17 — @ G3 — @ C13 — @ R7. PlatinumDragon: In my personal opinion, having the stones on the fourth line is stronger than the third line. I have changed my opinion after looking at the influence. I have heard that 17 stones is enough for equal players to not let a single live group. Is there anyone who can explain it to me? P.J.Traill: See the Kill-all Game for a little background. tapir: Living by 3-3 invasions doesn't look particularly difficult here. logan? 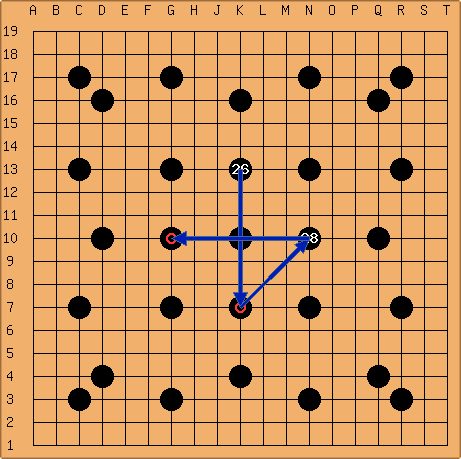 : Right, live in all four corners, then follow a shinogi strategy in the center. Handicaps 18 through 25 are at / R17 — / C3 — / C17 — / R3 — / N13 — / G7 — / G13 — / N7. 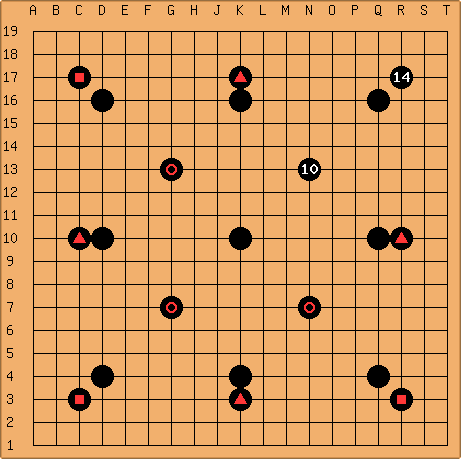 Rich: Robert Jasiek's page shows the official Japanese rules for placement of up to 17 handicap stones. They agree in large part with the following diagram, except that they don’t specify the four 10-3 points ( ). 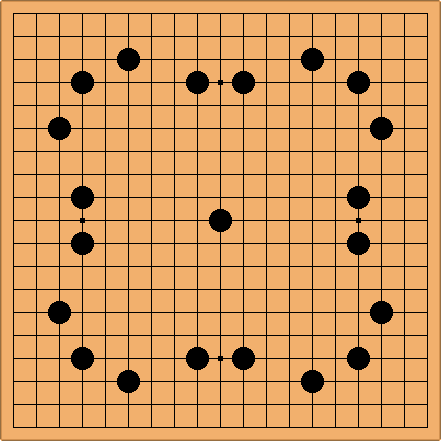 stones 18 – 21 at . A game Nemesis vs Janice Kim at this handicap was recalled on March 11, 2003 by 65.95.145.65 from almost 20 years earlier. 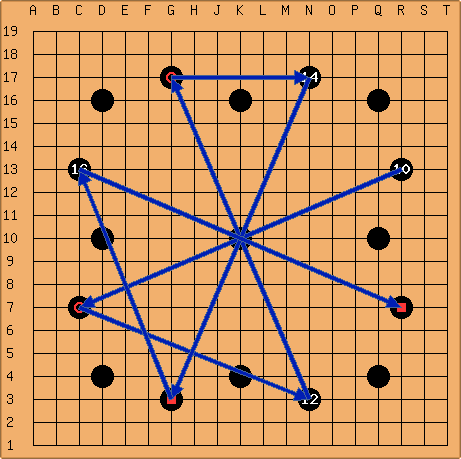 This arrangement was used when Akari fought Hikaru in Hikaru no Go, volume 6. Hikaru said “Use as many stones as you want” to her before the match and still trounced her – he was, after all, an insei at the time. P.J.Traill: Surely they do not always go in sequence – does tengen not pop in and out (starting with the 9 stone handicap!)? Or is the sequence in which Akari places them? P.J.Traill: Is this notable, and who is Gene Fellner anyway? I find him (probably) on Facebook, but these three links – – – are a bit surprising. juste: Does this mean that a 30k can beat a 9d most of the time? OneWeirdDude: As long as Black makes an effort to attack White, I don't see why not. AxSqrd: But how would white make eyes when black so obviously has everything blocked out? Roland Illig: The same as usual: try to separate the black stones, surround them and finally capture them to make eyes. 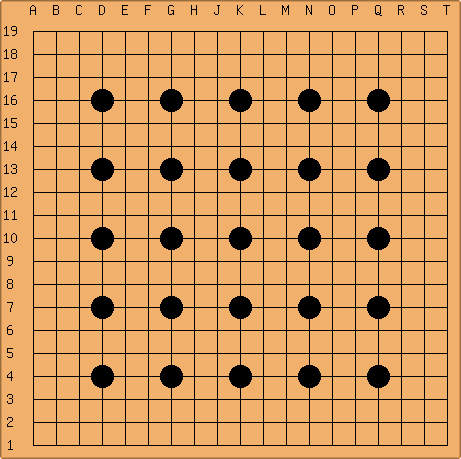 If Black can defend appropriately, giving that many handicap stones wasn't correct, and Black can no longer be called a 30k. Tapir: If one handicap stone is worth 13 points, than 41 * 13 = 533 with 533 >> 361. 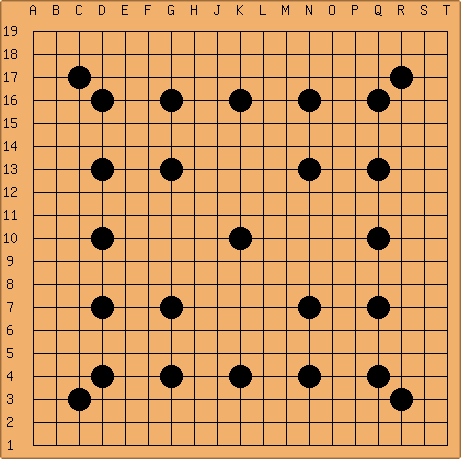 So black should not lose here. 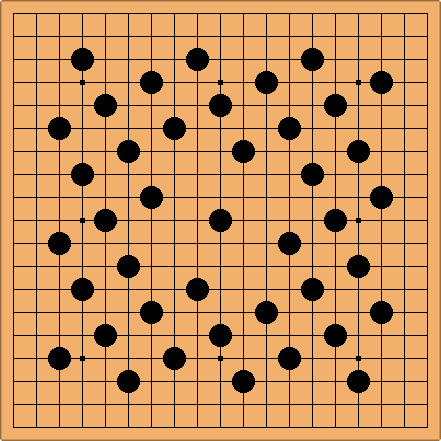 It may be that the range of go skill just isn't wide enough for 41 stones. No? Incidently you start as 20k at several places (EGF rating, IGS etc.) 20k to 7d range (EGF) gives 26 maximum handicap (26 * 13 = 338). P.J.Traill: An alternative interpretation is that a handicap stone is not worth 13 points to a 30k. Anyway handicapping such differences is presumably anything but an exact science; quite likely the 30k is a few stones stronger at the end, unless they are very young.